Load those wagons........kiss the kin goodbye.........get ready for adventure, drama, comedy, tragedy, and fantastic learning as we hit the Oregon Trail and head out west! Get ready to watch the Peregrine Falcons with these lessons and resources. The project begins in late February or early March when the Peregrine Falcons return to their nesting sites. This is a self-directed one classroom project. No registration is necessary. 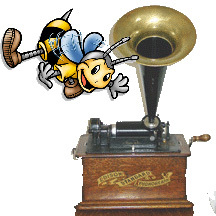 Learn about the history of the phonograph and listen to a sample of early recordings. There is a listening guide provided. As the billowing black clouds of dust rolled and swirled across the plains in the 1930s, the American landscape was drastically changed. This lesson explores primary sources such as sound recordings, images, and words from the dust bowl era. Collect and compare weather data using the tools provided on Weather Watch. The more you collect the more you can observe.